Whether the world needs it or not, the Smurfs are returning to the big screen this summer in The Smurfs 2 from Sony Pictures… and they’re coming to your TV in the form of a console game, too. 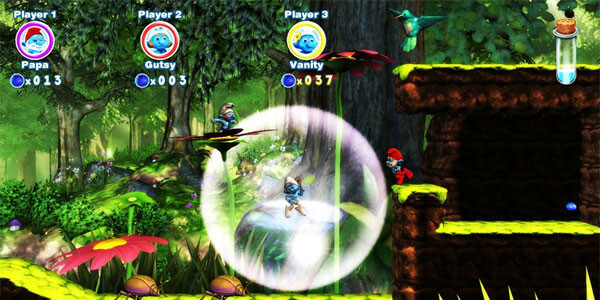 The little blue men (and one woman) will more or less follow the storyline of the film in their game, and players will get to prance around Smurf village before jetting off to Paris and New York. And the Lava Jungle. Oh, and some Arctic Tundra. No, those last two aren’t in the film. The game will have a multiplayer mode, so that you and three other friends can play together (or work against each other, possibly due to the fact that you’re making your friends play a Smurfs game). On the Wii U edition, five people will be able to play together, and player five will be able to use the GamePad to play Clockwork Smurf. There will be nine different Smurfs to unlock, each with their own special featured ability. If you’re eager for this one, look for it on the Wii U, Wii, PS3 and Xbox 360—with a special “interactive storytelling book” and mini-game collection for the DS. And you know what? It might not end up being as bad as it sounds. No, really! Ubisoft and WayForward Technologies are developing this one, and they’re known for giving up some decent offerings. WayForward has also developed film tie-ins before, such as Hotel Transylvania that released last year on the 3DS.